Vincent Leone has been named Executive Vice President and Chief Operating Officer of the company, and Benno Kippes has been promoted to Managing Director of Gammaflux Europe GmbH, the company’s European business based in Wiesbaden, Germany. 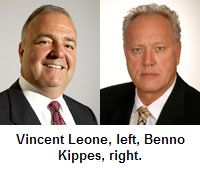 Both Leone and Kippes will report to Jeffrey Colman, Gammaflux President and Chief Executive Officer. Gammaflux has also announced the retirement of Rene Bertschi, formerly the Managing Director of Gammaflux Europe GmbH who started the company’s European business in 1997. Bertschi was very well known throughout the plastics industry, having spent many years with Husky prior to joining Gammaflux. Leone is a 14-year Gammaflux employee and since 2008 served as Vice President; prior to that, he was Director of Sales Operations – Western Hemisphere. He is now responsible for managing the day-to-day operations of the company, with key objectives being improving the company’s internal plant operations and also increasing the company’s presence throughout Asia. Kippes, who along with Bertschi joined Gammaflux Europe GmbH in 1997, takes over as Managing Director after 15 years as Director of Sales and Marketing. He will direct the company’s European operations and work to further increase Gammaflux’s market share and presence throughout the region.